The title "World's Strongest Coffee" is no overstatement; 660 milligrams of caffeine per 12 fluid ounce cup is over 200% the concentration of your average cup of coffee. 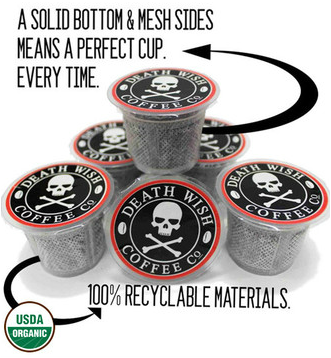 Classified as "Dangerous" by Ted Kallmyer at caffeineinformer.com, Death Wish's World's Strongest Coffee is not only the darkest roast we have reviewed all year, but appropriately named as well. Featuring a blend of some of the world's most popular and powerful varietals, this roast is bold, caffeinated, and flavorful. Maintaining a delicate balance of bittersweet chocolate, hazelnut, and molasses, the World's Strongest Coffee appeals to a much broader audience than the sleep-deprived. Though we had admittedly low expectations for this coffee, assuming an overly -caffeinated but flavor-deprived roast, we were astounded by the density and diversity of flavor present. Thanks to Death Wish Coffee for sending these over, and congratulations for discovering the strongest brew around!